When it comes to lawn care, there are a lot of myths and misconceptions out there about what practices are best. Today, C & L Landscape is busting some of these myths to help our Jacksonville residents take the best care of their lawns. So before you pick up that garden hose or break out the fertilizer, check out the truth behind these three myths. Myth: It doesn’t matter what time you water your lawn. 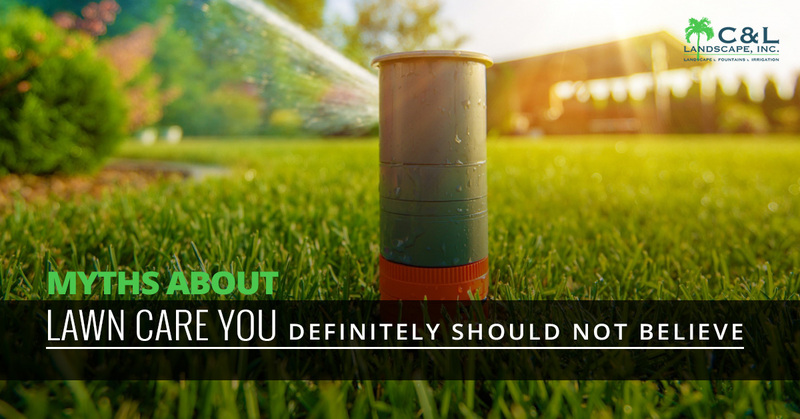 There are a handful of myths regarding what time to water your lawn. One of our favorites is “If you water your lawn at mid-day, your grass will burn because the water droplets act like magnifying glasses.” This is, obviously, not true. But there is an ideal time to water your lawn. Watering first thing in the morning, near sunrise, offers low evaporation levels so more water stays in your lawn. It also offers time for the grass to dry a little during the day. Grass Not Looking Green? Contact C & L Landscape Today! Myth: The shorter you cut your grass, the less you have to mow it. Well, this one is half-true because if you cut your grass super short you will kill it – and it follows that you don’t have to mow dead grass very often. However, we assume you want to keep your lawn green. When you cut your grass too short, you take away the ability for those blades to produce vital nutrients. Additionally, you expose the soil to direct sunlight which can lead to dry soil and, again, dead grass. It is recommended that your grass blades are no shorter than 3 inches. Myth: When you grass starts to wilt or turn brown, you need to water it. Wilting grass and plants can be a sign of many things, and needing a good watering is just one of them. In many cases, enlisting the help of professional landscapers can help you get to the root of the problem. For example, circles of dead grass, affectionately known as ‘fairy rings’, or grass that is browning and matted together can be a sign of a fungus and require a fungicide. Streaks of brown grass might be a sign of poor fertilizer distribution, and large swaths of brown, dry grass might indicate you need a good watering or that your sprinkler system design is not efficiently reaching all areas of your lawn. If you’re not sure what myths to believe about your grass, it may be best to contact the professionals. Our commercial and residential landscaping company can install sprinkler systems to make sure your Jacksonville lawn is watered evenly and at the right time of day and help diagnose issues and get your lawn back to the beautiful green color you love. Contact C & L Landscape today for all of your landscaping needs. It’s about service. It’s about quality results and work that is durable and reliable, providing only the best because that’s what you deserve. Landscaping is a craft that has been passed down through our generations, see the difference today. From parks and streetscapes to remodeling to lawn care, we do it all with an excellence that has given us a reputation throughout Florida. Learn more about what we can do for you and get your free quote today. It was a joy to work with the staff, managers, and workers. ©2019 C&L Landscape Inc. | All rights reserved.